Hey Folks! Sir Robert Okaji of the Vorpal Pen has now added Trend-Setter and Guru of Repurposing to his C.V.! Let’s just say, Kerouac’s got nothing on Okaji in terms of name-dropping-acquired “street-cred” — not to mention the latter’s impeccable taste in *cover art* 😜! 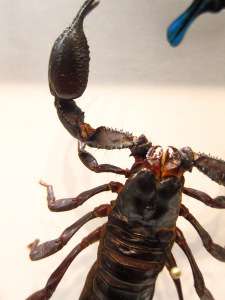 Bottom line: No home should be left un-accessorized — much less unprotected — by these scorpion-swatting (equally effective on spiders for domiciles of more northerly latitudes) symbols of social aplomb! 2) Coaster – a half-dozen copies of the book will keep you out of the doghouse, if you, like certain unnamed poets, occasionally, and without malice, set sweating pint glasses of frothy ale directly on antique cherry end-tables. Just place a copy of From Every Moment a Secondon all tabletops and flat surfaces around the home, and never worry about marring the furniture. Put your beverage glass directly upon the colorful cover, and let the poetry perform its magic. Who knew that paper was so absorbent!